This image shows a ghostly ring extending seven light-years across around the corpse of a massive star. 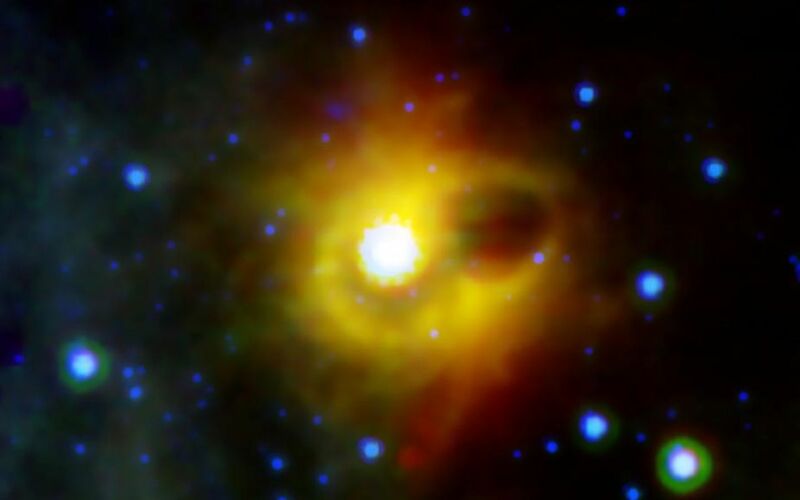 The collapsed star, called a magnetar, is located at the exact center of this image. 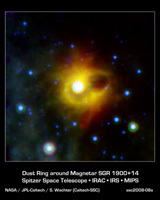 NASA's Spitzer Space Telescope imaged the mysterious ring around magnetar SGR 1900+14 in infrared light. 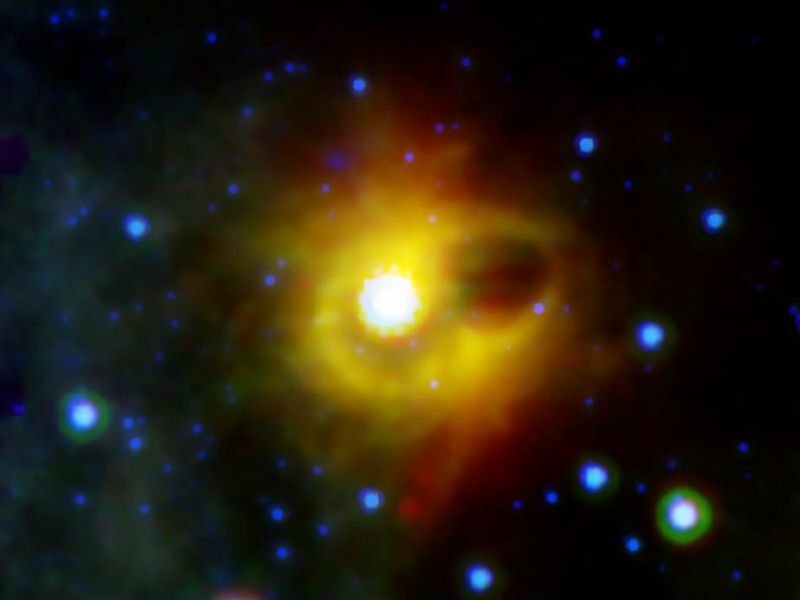 The magnetar itself is not visible in this image, as it has not been detected at infrared wavelengths (it has been seen in X-ray light). Magnetars are formed when a massive giant star ends its life in a supernova explosion, leaving behind a super dense neutron star with an incredibly strong magnetic field. The ring seen by Spitzer could not have formed during the original explosion, as any material as close to the star as the ring would have been disrupted by the supernova shock wave. Scientists suspect that the ring my actually be the edges of a bubble that was hollowed out by an explosive burst from the magnetar in 1998. The very bright region near the center of the image is a cluster of young stars, which may be illuminating the inner edge of the bubble, making it look like a ring in projection. 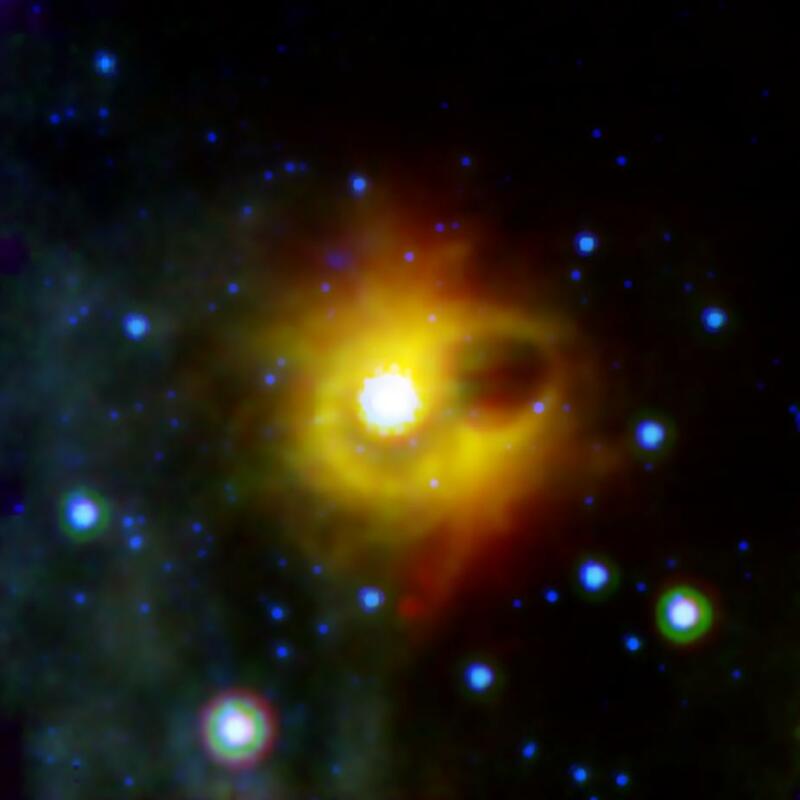 This composite image was taken using all three of Spitzer's science instruments. The blue color represents 8-micron infrared light taken by the infrared array camera, green is 16-micron light from the infrared spectograph, and red is 24-micron radiation from the multiband imaging photometer.